Canada AMEX Platinum Oneworld Sapphire Last Chance! I personally consider the American Express Platinum Card (Canada) to have the best benefits among all Canadian Credit cards. One of the pretty amazing benefits offered include Cathay Pacific Gold Elite status, which gives you oneworld sapphire tier status, which is their mid-tier level. 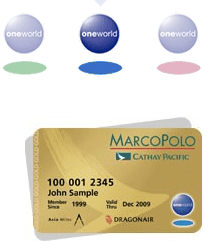 The oneworld page lists the benefits for their Sapphire Tier. You can also check the benefits on the Cathay Pacific page of their Gold Status. Keep in mind you do need to be a Canadian resident and have a Canadian credit file. As well, this benefits is not listed on the AMEX Platinum Benefits page, but I can assure you that this benefit will be here for the next month. This benefit is getting removed as of March 31st. To get it before then, however, you need to have applied and received your AMEX Platinum Card AND sent in the form to request Cathay Pacific Gold. Your status will then be valid until Jan 2015. This means that if you are considering getting the Platinum card, this is as good of a time as ever to get it. The current best available offer is 60,000 MR points with $1000 in purchases within the first three months of membership. This is probably the cheapest way to get status and a lot of MR points. Canadian MR points are transferrable to Aeroplan and Avios at a 1:1 ratio (which are the best partners). There is a $699 annual fee, but keep in mind you to get a $200 travel credit to offset any travel booked through the AMEX Travel per calendar, which is as good as cash. Thus, if you claim your credit both this year and next year, that totals to a $400 total credit over the two years. You can also match this status to other statuses. TK Gold (and Star Gold) used to be a gimme, but they’ve tightened up on their matching requirements. However, you might have luck matching to an intermediate status and then to TK Gold (and AS MVP as well, which doesn’t match CX Gold). This is just one of the benefits of the Platinum Card which make it such a valuable card to have for the benefits. Note that this is my referral offer. The current public offer only offers 50,000 points with an approval. Jeff do you mind hinting what that intermediary may be? Does everyone get the extension until Jan ’15? Even if you cancel your Amex before then? I currently have this card, and although I got the letter saying that their relationship with CX would be ending, I haven’t received any subsequent communication informing me of what would happen with my CX status. Yes, if you currently already have AMEX Plat and CX Gold you should call in to ensure your status is renewed until Jan 2015. What intermediate status would you suggest? …. sent in, or they have to receive the form by March 31rst? I do believe they have to receive the form before March 31st. But I’m assuming that when you send it in they receive it. That’s exactly why I decided to get the Platinum before this benefit goes away. Bottom line, what can you do with the points ? Definitely. As I said 60,000 MR at the minimum 60k BA Avios or 60k Aeroplan. So with 9k BA Avios you can do Montreal – NYC roundtrip. That would mean 6 roundtrips at least. Or you could do an economy roundtrip to Europe (which is 60k Aeroplan) with two stops in addition to your destination, so you could visit Paris, London, and Porto, for example. I’d say at the minimum you can get at least $750 worth of travel (if not way more) from the 60,000 points. This is on top of the $400 travel credit you get over two years, the CX Gold status if you apply now, as well as the other travel benefits offered. As long as you do have an intention to travel you will come up on top and I am happy to help you use your points to maximize your return. The Gold Card does have no annual fee so generally what I do is cycle the cards. I’ll hold the Amex Plat for 11 months, then apply for the Gold card and switch, and repeat the process. So you only end up with one annual fee every two years. But do keep in mind that oneworld status applications must be received March 31, which is why this post is written (as if you don’t have the card right now it’s a must get if you want the elite status). Also, the gold card carries no annual fee for the first year. Wow thanks Jeff for the detailed reply! Once you apply for this card, can you ever cancel and reapply to get the same (or similar) bonuses? Where do I find the Cathay status request form? You can call amex, and they can send you a form. Hi Jeff, re the Canadian Amex plat with CX gold tier benefit u mentioned earlier, any idea if supplementary card members get that benefit as well and not just limit to the basic member? No, unfortunately only the primary cardholder gets CX Gold. Do I have time (now March 14) to apply and receive AMEX Plantinum and apply to CP for status? If you can get the card and the CX forms fast enough. I’d say yes, given the card will take at most two weeks to ship. I assume that if you call amex and let them know they’d probably ship you the card/forms earlier. Let me know!